Notch1 is involved in directing cell fate decisions in a variety of developmental scenarios. Extending previous experiments in mice, we generated transgenic rats expressing the intracellular domain of Notch1 in the thymus. Importantly, this leads to sustained expression of the pre-TCR throughout thymocyte development, accompanied by a reduction of αβTCR complexes. In addition, re-expression of RAG-1 and RAG-2 in TCRβ+ cells is impaired, and the Vα repertoire is altered. Consequently, thymocytes in transgenic rats do not undergo positive selection and largely fail to progress to the single positive stage. According to our model, the previously reported effects of Notch1 on the CD4/CD8 cell fate decision may be explained by a differential sensitivity of the two lineages toward altered TCR signaling. In the thymus, bone marrow-derived precursor cells develop into T cells through a series of differentiation steps (1). Thymocytes can be subdivided into four major subsets based on the expression of their CD4 and CD8 coreceptors. The CD4−CD8− double negative (DN)3 cells represent the most immature cell type among all thymocytes. Rearrangement of the TCRB gene locus in late DN cells is the first step toward the expression of a functional TCR and is therefore considered the first checkpoint in thymocyte development (2). The productively rearranged TCRβ chain becomes assembled into the pre-TCR together with the invariant pre-Tα chain and components of the CD3 complex. Signaling from the pre-TCR is a prerequisite for survival, guarantees allelic exclusion of the TCRB locus by down-regulating expression of RAG-1 and RAG-2, and results in proliferation. In the rat, development then proceeds through a CD8+TCRβlow immature single positive (SP) stage (iCD8) to the major CD4+CD8+ double positive (DP) subset of thymocytes. In these cells, the TCRAD gene locus becomes rearranged after renewed expression of the RAG enzymes (3). In the case of unproductive recombinations, the TCRAD gene locus has the unique ability to undergo secondary rearrangements involving more distally located Vα and Jα gene segments (4, 5). DP cells expressing intermediate levels of αβTCR/CD3 complex on the surface undergo positive and negative selection based on the affinity of their TCR for peptide-MHC complexes on thymic epithelial and dendritic cells (6). Selected thymocytes subsequently up-regulate CD69 and their TCR, down-regulate CD4 or CD8, depending on MHC restriction, and finally become mature SP T cells. Multiple signal transduction pathways are involved in T cell development and in directing the lineage decisions involved therein. One such example is Notch, a family of evolutionarily conserved transmembrane receptors involved in the choice between alternative cell fates (7, 8). Four Notch proteins have been identified in the mammalian immune system, making them good candidates for key players in thymocyte development (9) and T cell function (10, 11). The role of Notch1 has been subject to intensive investigation. Several lines of evidence indicate that it is involved in the lineage decisions taking place in hemopoietic progenitors and early thymic precursor cells when the decision is made to become a T cell rather than a B or NK cell. Conditional inactivation of Notch1 in hemopoietic progenitors leads to a block in T cell development and the appearance of ectopic B cells in the thymus (12). The strikingly similar phenotype of mice carrying a deletion of the downstream transcription factor CSL (core binding factor-1, suppressor of hairless, Lag1) further suggests that signaling via this particular pathway accounts for the control of the T/B cell fate decision by Notch1 (13). The finding that overexpression of the Notch1-antagonizing molecules Deltex1 or Lunatic Fringe but not of Numb redirects lymphoid progenitor cell development to the B cell lineage indicates that refined mechanisms are at work in the regulation of this lineage decision (14, 15, 16). In contrast to mice, inhibition of Notch signaling in the rat results in an expansion of thymic NK cells at the expense of T cell development (17). This suggests that Notch proteins are also involved in the NK/T cell fate decision in the thymus. Although the role of Notch1 in T cell commitment is not doubted, its function in later stages of thymocyte development is controversial. Notch1 has been described as promoting a CD8 fate of SP thymocytes, as inhibiting maturation of SP cells in general or even as having no influence on the CD4/CD8 lineage decision (7, 8). However, it appears that these differences partly derive from the individual experimental approaches taken. Two strains of conditional Notch1-knockout (KO) mice where the gene had been deleted at different time points during the DN stage of thymocyte development failed to reveal any effect on the generation of SP thymocytes (18, 19). Thus, Notch1 does not play an essential, nonredundant role in this lineage decision. In contrast, expression of the constitutively active intracellular domain of Notch1 (Notch1IC) in transgenic mice reproducibly affected the CD4/CD8 cell fate decision. Direct comparison of two different strains expressing Notch1IC in developing thymocytes showed that the transgene inhibits the development of CD4 SP cells while promoting the generation of CD8 SP cells (20, 21, 22). In a complementary approach, Pear and colleagues (23) studied the developmental potential of retrovirally transduced bone marrow cells expressing Notch1IC and observed a strongly impaired progression from the DP to the SP stage. This was assigned to compromised TCR signaling and lack of positive selection because up-regulation of CD25 and CD69 was completely abrogated in response to TCR/CD2 coengagement. However, the mechanism by which Notch1 attenuates TCR signaling in DP cells remains unclear. Using Notch1IC-transgenic rats, we have now obtained data that may explain some of these earlier observations. Thymocytes from transgenic rats show sustained mRNA and surface expression of the pre-TCR throughout development, leading to a partial replacement of αβTCR complexes on TCRβ+ thymocytes. 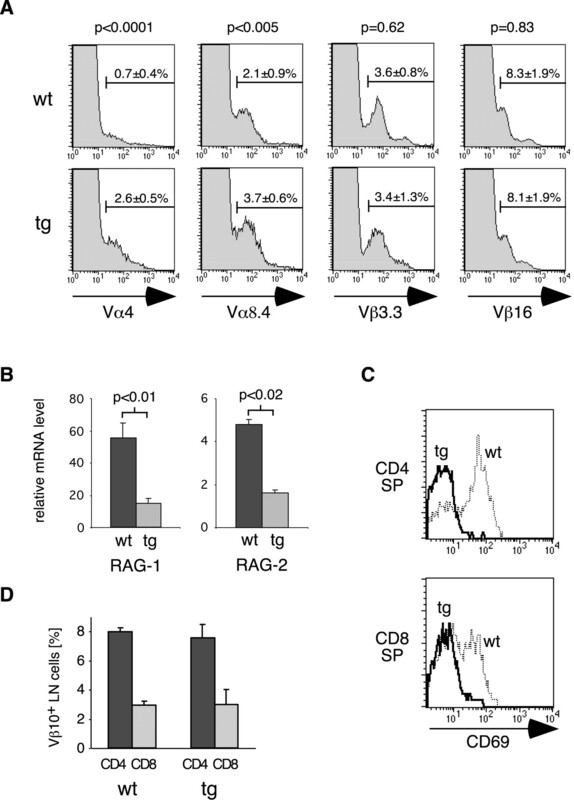 This apparently suppresses re-expression of RAG-1 and RAG-2 in TCRβint cells, impairs the rearrangement of the TCRAD gene locus, and results in an altered Vα repertoire. Consequently, thymocytes in transgenic rats fail to mature properly, do not undergo positive selection, and therefore show an impaired ability to progress to the SP stage. Based on the assumption that the two lineages of SP thymocytes are differentially sensitive to altered TCR signaling, our findings may also explain the repeatedly observed bias toward the CD8 lineage. Taken together, we provide a novel mechanism of how constitutively active Notch1 may affect the generation of mature T cells in the thymus. Transgenesis was performed according to standard protocols (24, 25, 26). 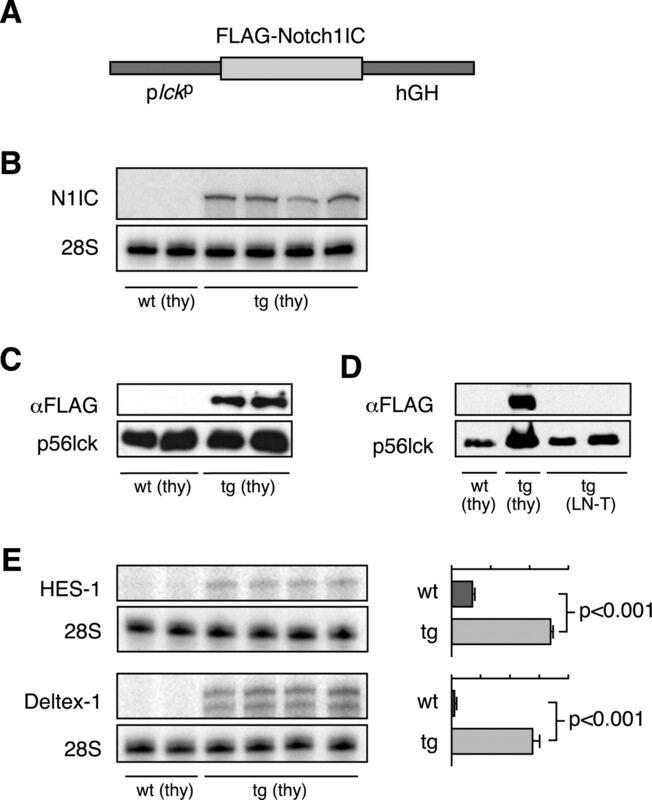 The transgene vector encompassing the proximal lck promoter, the FLAG epitope, the intracellular domain of mouse Notch1, and a hGH minigene has been described previously (21). A SpeI fragment containing the entire insert was purified and injected into (Crl:CD × Lew/Crl)F1 embryos. The zygotes were cultured overnight, and two-cell stage embryos were transferred to the oviduct of pseudopregnant CD females. Transgenic founders were identified by PCR and Southern blot, and the copy number of the transgene was calculated on the basis of densitometric analysis of Southern blots using a phosphor imager. Analyses requiring a defined haplotype were performed in rats that had been backcrossed to the inbred Lewis strain for at least five generations. All animal experiments were conducted in accordance with accepted standards of humane animal care. All FITC, PE, PE-Cy5, Cy5, and APC-conjugated Abs used during the flow cytometric analyses were obtained from BD Biosciences unless otherwise indicated: Ox34 (CD2), Ox22 (CD45RC), Ox8 (CD8α), Ox35 (CD4), Ox38 (CD4), Ox7 (Thy1), JJ319 (CD28), V65 (γδTCR), Ox33 (CD45RA), R73 (TCRβ), 10/78 (NKR-P1A), G4.18 (CD3), G99 (Vα4), G177 (Vα8.4), C-A11 (Vβ3.3), R78 (Vβ8.2), B73 (Vβ8.5), G101 (Vβ10), 18B1 (Vβ13), His42 (Vβ16), 2F5 (pre-Tα), MOPC-31C (mIgG1κ isotype control Ab), Yuggu-F6 (monoclonal anti-rCD69; a kind gift by Dr. J.-H. Park, Bethesda, MD). The Ab against the FLAG epitope was obtained from Sigma-Aldrich, and human rIL-2 (hrIL-2) was purchased from R&D Systems. Thymocytes, lymph node cells, and splenic leukocytes were isolated by passing the freshly isolated organs through a 40-μm nylon mesh. The cells were washed in FACS buffer (PBS with 0.5% BSA and 0.05% NaN3), counted, and stained using various Ab combinations. Analysis by four-color flow cytometry was performed using a BD Biosciences FACSCalibur machine and CELLQUEST software. GraphPad Prism was used for statistical analysis. Preparative sorting of TCRhigh thymocytes was performed on a BD Biosciences FACSDiva machine after staining the cells with CyChrome-conjugated G4.18 Ab. To quantify surface expression of the pre-Tα chain, the mAb 2F5 or the isotype control Ab MOPC-31C was used in combination with anti-mIg-bio and CyChrome-conjugated streptavidin (27). To calculate the difference in pre-Tα surface expression, the mean fluorescence intensity between cells stained with 2F5 and MOPC-31C was determined and compared between the genotypes. Freshly isolated thymi were solubilized in radioimmunoprecipitation assay buffer using a dounce homogenizer. Equal amounts of protein were separated on a 10% SDS-PAGE gel and transferred onto a polyvinylidene difluoride membrane. The blot was stained with the appropriate Ab and developed using ECL as a substrate (Amersham Biosciences). RNase protection analysis was performed as described previously (28). The plasmids used for the generation of the probes were generated by subcloning PCR fragments corresponding to the rat cDNAs of Hes-1, Deltex-1, TCRα, TCRβ, and pre-Tα. The 28S rRNA probe was obtained from Ambion. Quantification was performed by phosphor imager analysis. Quantitative PCR was performed using an iCycler instrument (Bio-Rad). cDNA was synthesized by oligo(dT) priming starting from 0.3 to 1.0 μg of total RNA as previously described (29) and amplified using primers specific for rat TCRα, TCRβ, pre-Tα, RAG-1, RAG-2, and hypoxanthine phosphoribosyltransferase (HPRT) (sequences are available upon request). In parallel, a standard curve was established by amplifying HPRT from defined amounts of PCR product. This allowed the absolute amount of each transcript to be determined (17). iCD8 thymocytes were isolated by depleting CD4+ and TCRβ+ cells followed by positive selection of CD8+ cells, according to the manufacturer’s instructions (Miltenyi Biotech). Isolation of TCRβ+ thymocytes was achieved by positive selection using R73-coupled magnetic beads. Lymph node T cells were purified by positively selecting CD3+ cells using a FITC-labeled mAb. The purity of the cells was assessed by analyzing an aliquot by FACS for expression of CD4, CD8, and TCRβ. Magnetically sorted iCD8 thymocytes were cultured overnight at 5 × 105 cells/ml RPMI 1640 medium containing 10% FCS in 24-well plates (30). The next morning, the cells were plated at 5 × 105 cells/ml in anti-TCRβ-coated 24-well plates (4 μg/ml R73) and cultured in the presence of 500 U/ml hrIL-2 for 4 days. Subsequently, they were harvested, replated at 5 × 105 cells/ml in uncoated 24-well plates, cultured for another night in the presence of 500 U of hrIL-2, and analyzed by flow cytometry. To study programmed cell death, total thymocytes were cultured at 1 × 106 cells/ml RPMI 1640 medium containing 10% FCS in 48-well plates for 24 h. Subsequently, the cells were harvested and analyzed by flow cytometry using annexin V and mAbs against TCRβ, CD4, and CD8. Transgenic and KO experiments in mice have led to partially conflicting results concerning the role of Notch1 in thymocyte development (7, 8). As an alternative approach to address this issue, we generated transgenic rats expressing the constitutively active Notch1IC under the control of the proximal lck-promoter (Fig. 1⇓A). Screening by Southern blot analysis and PCR identified four transgenic founder rats, three of which expressed Notch1IC at high levels in the thymus. Because the three lines showed a similar phenotype in initial analyses (data not shown), all the experiments described were conducted in rats of line NICA, which carries 30 copies of the transgene. To exclude potential influences from lymphoma development in older animals (J. van den Brandt and H. Reichardt, manuscript in preparation), we restricted our analyses to rats of 3–28 days of age (22). Characterization of NICA-transgenic rats. A, Schematic representation of the transgene construct consisting of the proximal lck-promoter (plckp), a FLAG epitope, the intracellular domain of Notch1, and a human growth hormone minigene (hGH). B, RNase protection analysis of transgenic Notch1IC (N1IC) mRNA expression in the thymus (thy) of 28-day-old WT and transgenic rats. Expression of 28S rRNA was used as a loading control. C and D, Analysis of transgenic protein expression in the thy and lymph node T cells (LN-T) by Western blot analysis using Abs against the FLAG epitope and p56lck as a control. E, RNase protection analysis of HES-1 and Deltex-1 mRNA expression in the thy of 28-day-old WT and transgenic rats. In addition to the representative experiment shown, quantification by phosphor imager and statistical analysis using Student’s t test is depicted. Specific expression of Notch1IC mRNA in the thymus of NICA-transgenic rats was demonstrated by RNase protection assay (Fig. 1⇑B). Western blot analysis further confirmed the presence of the transgenic protein in the thymus but not in lymph node T cells of young NICA rats (Fig. 1⇑, C and D). It is well documented that Notch1 signaling results in the transcriptional activation of several genes, including HES-1 and Deltex-1 (20). To determine whether the transgene was functional, we examined the mRNA levels of these two Notch1 target genes in the thymus by RNase protection assay. Quantification revealed that the expression of HES-1 was increased 5-fold, and the expression of Deltex-1 was increased 25-fold in transgenic rats (Fig. 1⇑E). Taken together, these data demonstrate that the intracellular domain of Notch1 is expressed at high levels in the thymus of NICA rats and leads to an elevated expression of Notch1 target genes. To study the impact of the transgene on lymphocyte development, thymic cellularity and the number of peripheral lymphocytes were determined. The number of thymocytes was similar in wild-type (WT) and transgenic rats at every time point from birth up to 4 wk of age (Fig. 2⇓A and data not shown). However, in the periphery, NICA rats were found to be severely T lymphopenic. The lymph nodes of NICA rats were almost completely devoid of T cells, and also, in the spleen, the number of mature T cells was strongly reduced. This trend held throughout the whole postnatal period and was most pronounced at 28 days of age (Fig. 2⇓A and data not shown). Analysis of thymic cellularity and numbers of peripheral T cells. A, The total number of thymocytes, lymph nodes, and splenic T cells was studied in WT and transgenic (tg) rats of 14, 21, and 28 days of age. The significance was determined using Student’s t test (∗, p < 0.05; ∗∗, p < 0.01; ∗∗∗, p < 0.001). B, The ratio between mature CD4 and CD8 cells was determined in the thymus, lymph nodes, and the spleen by flow cytometry. C, Blood was cleared of erythrocytes by hypoosmotic shock and subsequently analyzed by flow cytometry for the relative representation of T cells. Next, we studied whether CD4+ and CD8+ T cells were differentially affected by the constitutive activation of Notch1. In the thymus, the ratio between CD4 SP and CD8 SP cells was reduced markedly (Fig. 2⇑B). Interestingly, a similar shift toward the CD8 lineage was found in the spleen of transgenic rats, whereas the few mature CD4+ and CD8+ T cells in the lymph nodes were present at the same ratio as in WT rats (Fig. 2⇑B). Flow cytometric analysis further revealed dramatically reduced numbers of T cells in the blood. Whereas 44% of the leukocytes found in WT rats were T cells, this proportion was only 4% in transgenic animals (Fig. 2⇑C). In summary, transgenic thymocytes apparently fail to develop into mature T cells capable of efficiently colonizing the secondary lymphoid organs. To characterize thymocyte development in transgenic rats, we performed a number of flow cytometric analyses. This is exemplified for 28-day-old rats but was found to be similar throughout the whole postnatal period (Fig. 3⇓ and data not shown). Analysis of the CD4/CD8 profile revealed a severe reduction in the percentage and number of SP thymocytes in NICA rats, particularly CD4 SP cells (Fig. 3⇓A). Analysis of TCRβ expression further suggests that the progression to stages beyond the β-selection checkpoint is impaired. In particular, the percentage of TCRβ− cells was increased at the expense of cells expressing intermediate surface levels of the TCRβ chain. Although the number of TCRβhigh cells was almost unchanged in the thymus of transgenic rats, we found a profound difference concerning their CD4/CD8 profile (Fig. 3⇓A). 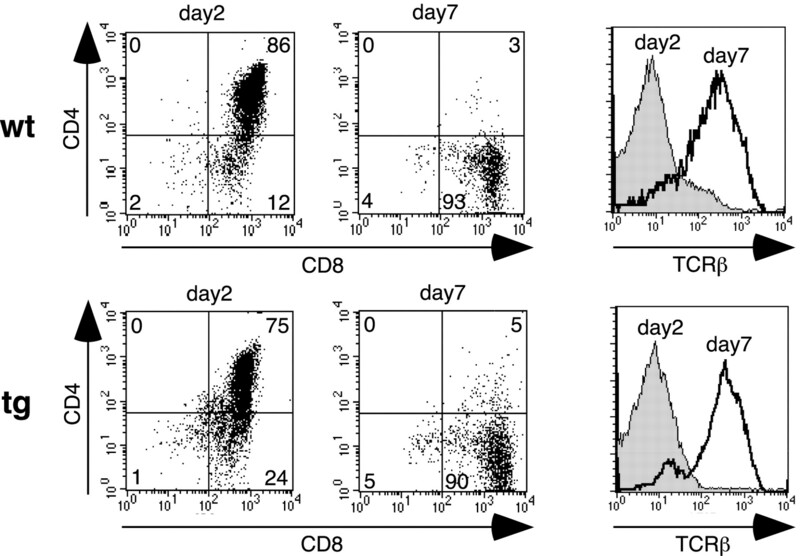 In contrast to controls, the TCRβhigh cells in the transgenic rats were predominantly DP thymocytes accompanied by a dramatic reduction in mature CD4 and CD8 SP cells (Fig. 3⇓A). The aberrant thymocyte development was further confirmed by studying the CD2/CD3 profile. Although in WT rats initial up-regulation of CD3 is accompanied by a concomitant down-regulation of CD2, NICA thymocytes remain CD2high during the complete course of thymocyte development (Fig. 3⇓A). Taken together, these data suggest that constitutive Notch1 signaling impairs differentiation processes during and after the progression from the DN to the DP stage and results in greatly reduced numbers of mature SP thymocytes due to a defective transition from the DP to the SP stage. Flow cytometric analysis of the thymus. A, Thymocytes obtained from 28-day-old WT and transgenic (tg) rats were stained either for CD4, CD8, and TCRβ or CD2 and CD3. Representative percentages of cells in the respective gates are indicated in the FACS plots. B, Thymocytes were stained with mAbs against the B cell marker CD45RA (Ox33), the NK cell marker NKR-P1A (10/78), or the γδΤ cell receptor (V65). DN1 cells were stained with a combination of mAbs based on their characterization in the rat as CD45RC+CD2−CD4−CD8− (17 ). n = 10 for all analyses. Notch1 signaling was described previously to affect thymic cell fate decisions other than those of the αβT cell lineage (7, 8). Importantly, we found an unaltered representation of B, NK, and γδT cells, as well as thymocytes of the DN1 stage (Fig. 3⇑B). Whereas the lineage decisions between T, B, and NK cells presumably occur before the onset of expression of the transgene and therefore alterations were not to be expected, we conclude that the cell fate decision between αβ and γδT cells is not influenced by Notch1 overexpression in the rat. It was shown previously that high expression of CD2 correlates with pre-TCR signaling (31). Given that the pre-Tα chain is a known target of Notch1 (32), this prompted us to examine the composition of the TCR complexes on thymocytes from transgenic NICA rats. Firstly, we analyzed the mRNA levels of the TCRα, TCRβ, and pre-Tα chains in total thymocytes by RNase protection assay. As predicted, expression of the pre-Tα chain was increased strongly. In contrast, expression of the TCRα chain was reduced, whereas TCRβ mRNA levels remained unchanged (Fig. 4⇓A). Next, we magnetically purified TCRβ+ thymocytes, which are composed of TCRint and TCRhigh cells. These thymocytes have progressed successfully to the DP stage and therefore should predominantly express the TCRα but not the pre-Tα (Fig. 4⇓B). Subsequent quantification of the absolute mRNA levels of the three TCR chains by real-time PCR confirmed our initial observations: TCRα expression was decreased 4-fold, TCRβ expression was unchanged, and pre-Tα expression was increased 4-fold. To further investigate these changes in TCRβhigh thymocytes, we purified this cell population by preparative FACS. Much to our surprise, the changes in pre-Tα and TCRα expression were even more pronounced as compared with all TCRβ+ thymocytes (Fig. 4⇓B). This strongly suggests that the TCR complexes on thymocytes from transgenic NICA rats are at least partially comprised of the pre-TCR instead of the αβTCR. mRNA expression analysis of the TCR chains. A, RNase protection analysis of TCRα, TCRβ, and pre-Tα mRNA expression using total thymocyte preparations. 28S rRNA expression was used as a loading control. B, Quantitative RT-PCR analysis of TCRα, TCRβ, and pre-Tα mRNA expression in magnetically sorted TCRβ+ and FACS-sorted TCRβhigh thymocytes from WT and transgenic (tg) rats. Relative mRNA levels were obtained by normalization to the expression of HPRT. Statistical analysis was performed using Student’s t test, n = 4 (TCRβ+) and n = 3 (TCRβhigh). To confirm that the observed effects on gene expression also translate into an altered composition of TCR complexes on the cell surface, we performed a series of flow cytometric analyses. First, we investigated pre-Tα surface expression in NICA rats, taking advantage of our finding that the monoclonal anti-mouse pre-Tα Ab 2F5 (33) also binds the rat homologue. As demonstrated in mice (27), this Ab is capable of detecting low but specific pre-Tα surface staining in DP thymocytes of WT rats (Fig. 5⇓A). Importantly, DP thymocytes derived from NICA rats showed a >4-fold increase in a pre-Tα surface expression as compared with WT cells. This is in strong support of our hypothesis that the high pre-Tα mRNA levels also translate into elevated surface expression of the pre-TCR (Fig. 5⇓A). Furthermore, increased pre-Tα staining could be demonstrated for TCRβint as well as TCRβhigh cells, indicating that pre-TCR surface expression in NICA rats is maintained throughout thymocyte development. Flow cytometric analysis of pre-Tα and TCRα surface expression. A, Total thymocytes from WT and transgenic (tg) rats were stained with the pre-Tα-specific Ab 2F5 or its isotype control MOPC-31C in combination with mAbs against CD4, CD8, or TCRβ. Dotted lines correspond to the isotype control, and filled histograms correspond to the pre-Tα Ab. Quantification was performed as described in Materials and Methods. B, Analysis of surface expression of Vα4 or Vα8.4 gene segment containing TCRα chains in total thymocyte preparations by flow cytometry. The cells were gated on TCRβhigh cells and the mean fluorescence intensity (MFI) of the Vα+ cells determined. One representative analysis for each staining is depicted. C, Statistical analysis of TCRβ and Vα surface expression. This was accomplished by measuring the MFI using the mAbs R73 (TCRβ), G99 (Vα4), and G177 (Vα8.4) and by measuring the normalization of the values in tg rats to the MFI measured in WT thymocytes. Statistical analysis was performed using Student’s t test, n = 9. According to the mRNA data, increased pre-TCR expression should be paralleled by reduced expression of TCR complexes containing the α chain. Because there is no Ab available that is specific for the constant region of the TCRα chain, we determined the surface expression of Vα4 and Vα8.4 on the surface of TCRβhigh thymocytes (34). Importantly, the mean fluorescence intensity and therefore the number of these TCRα molecules on each individual cell was reduced by 35% on average, whereas the surface expression of the TCRβ chain was not significantly altered (Fig. 5⇑, B and C). Collectively, our data indicate that roughly one-third of the TCRβ chains expressed on the surface of transgenic DP thymocytes are assembled in pre-TCR complexes rather than normal αβTCR complexes. In late DN thymocytes, recombination of the TCRB gene locus is accomplished with the help of RAG-1 and RAG-2. Tonic signaling from the pre-TCR subsequently shuts down RAG expression, which is only re-established in DP thymocytes to allow rearrangement of the TCRAD gene locus to occur. To study the functional consequence of pre-TCR signaling in DP thymocytes, we determined the mRNA levels of RAG-1 and RAG-2 by quantitative PCR. As predicted, expression of both enzymes was strongly reduced in magnetically purified TCRβ+ thymocytes from transgenic rats as compared with WT controls, whereas RAG-1 and RAG-2 mRNA was almost undetectable in TCRβhigh thymocytes from both genotypes (Fig. 6⇓B and data not shown). We conclude that continuous expression of the pre-TCR on thymocytes that have successfully passed the β-selection checkpoint prevents re-expression of RAG-1 and RAG-2 in TCRβint cells. Analysis of the TCRα repertoire and thymocyte selection. A, Total thymocytes from WT and transgenic (tg) rats were stained with the TCRβ-specific mAb R73 in combination with Abs recognizing TCR chains containing the Vα4, Vα8.4, Vβ3.3, and Vβ16 segments. A representative FACS plot for each experiment is depicted. Statistical analysis of the percentage of cells expressing each V segment as well as its significance are depicted (mean ± SD, Student’s t test, n = 15). B, Quantitative RT-PCR analysis of RAG-1 and RAG-2 mRNA expression in TCRβ+ thymocytes from WT and tg rats. Relative mRNA levels were obtained by normalization to the expression of HPRT. Statistical analysis was performed using Student’s t test, n = 4. C, FACS analysis of CD69 surface expression in total thymocytes and after gating on CD4 SP and CD8 SP thymocytes comparing WT and tg rats. D, FACS analysis of CD4+ and CD8+ lymph node T cells for the expression of a TCR containing the Vβ10 gene segment. n = 8. It is well known that rearrangement of the TCRAD gene locus begins with the more centrally located Vα and Jα gene segments. In the case of unsuccessful recombinations, secondary rearrangements involving more distally located gene segments frequently occurred (4, 5). Therefore, we were asking whether the reduced expression of RAG-1 and RAG-2 in TCRβint cells from transgenic rats impairs the frequency with which these secondary rearrangements take place. To test this hypothesis, we analyzed the relative representation of Vα4 and Vα8.4 (34). 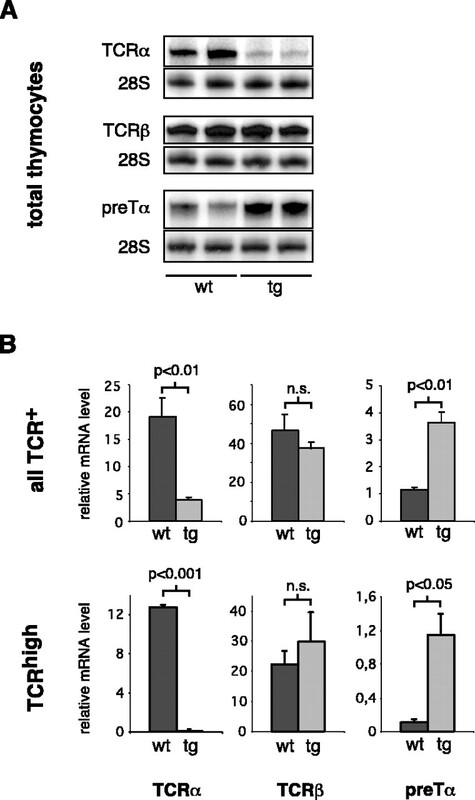 The frequency of both Vα chains was altered significantly in TCRβ+ thymocytes from transgenic rats as compared with WT animals, whereas no such differences were observed for any of the Vβ chains tested (Fig. 6⇑A and data not shown). Interestingly, the gene segment corresponding to Vα8.4 has been mapped to the central region of the TCRAD locus in close vicinity to the Jα cluster (4). Therefore, the increased frequency of Vα8.4 containing TCR complexes in NICA rats is in agreement with the notion that impaired rearrangement favors the representation of central gene segments (35). Although correlative only, this finding suggests that reduced RAG expression during the DP stage impairs secondary rearrangements at the TCRAD locus and thereby alters the T cell repertoire. Under normal circumstances, CD69 becomes up-regulated on DP thymocytes upon positive selection and remains high during progression to the SP stage. Analysis of total thymocytes revealed the complete absence of CD69-expressing cells in NICA rats, which was further confirmed by gating on SP cells (Fig. 6⇑C). This indicates that the developmental defects occurring in NICA thymocytes prevent positive selection and presumably account for the arrest at the TCRhigh DP stage, as well as the severely reduced number of SP cells in transgenic rats. To study whether the few mature T cells found in the periphery of the transgenic rats have undergone normal selection, we took advantage of the earlier observation that, in the Lewis rat, TCRs containing the Vβ10 gene segment are strongly overselected into the CD4 subset as compared with CD8+ cells (36). Lymph node cells of WT and transgenic origin were isolated and stained for CD4, CD8, and Vβ10 surface expression. Interestingly, overselection of Vβ10 in CD4 cells was unaffected by the transgene (Fig. 6⇑D), indicating that those T cells that made it to the periphery in transgenic rats have been normally selected. In the light of the impaired positive selection, we wondered whether immature transgenic DP cells would normally develop into TCRβhigh SP thymocytes in a situation where selection is dispensable. Furthermore, we wanted to investigate whether engagement of the αβTCR by a mAb would overcome the developmental block of transgenic thymocytes and allow them to mature into TCRhigh SP cells. To this end, we used a previously described in vitro model (30). First, we magnetically purified iCD8 cells from the thymus of WT and transgenic rats and allowed them to develop into TCRβdim DP cells during overnight culture (Fig. 7⇓). Subsequently, these “virgin” DP cells were cultured in the presence of plate-bound anti-TCRβ Ab and high concentrations of IL-2 for 5 days and analyzed by flow cytometry. This regime had been shown previously to result in the exclusive generation of mature CD8 SP cells (30). Indeed, we obtained TCRβhigh CD8 SP cells irrespective of whether thymocytes from WT or transgenic rats were cultured (Fig. 7⇓). This clearly indicates that immature thymocytes from transgenic rats have the potential to mature into SP cells if MHC interactions are replaced and the pre-TCR signal overcome by engagement of the αβTCR with a mAb. Therefore, these data support our model that impaired TCR signaling and a lack of positive selection are responsible for the developmental arrest on the TCRβhigh DP stage. In vitro maturation of virgin DP thymocytes. WT and transgenic (tg) iCD8 thymocytes were cultured overnight to allow development into TCRβdim DP cells (day 2) and then transferred to plates coated with anti-TCR mAb R73 and supplemented with IL-2. On day 7 of the culture, the cells were analyzed by flow cytometry for expression of CD4, CD8, and TCRβ. The percentage of cells of each phenotype is depicted in the FACS plots. One representative experiment of four is shown. Given the impaired ability of transgenic TCRβhigh DP cells to develop into SP cells in vivo, we asked whether they have acquired functional properties different from those of WT TCRβhigh cells. To test this hypothesis, we analyzed their sensitivity to spontaneous apoptosis. 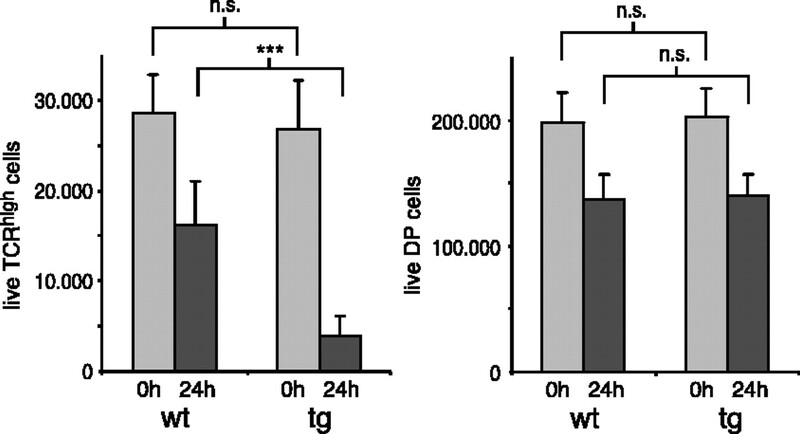 Total thymocyte preparations were cultured for 24 h, and the absolute numbers of annexin V− DP and TCRβhigh cells were determined (Fig. 8⇓). Interestingly, spontaneous apoptosis of transgenic TCRβhigh but not DP thymocytes was strongly increased as compared with WT cells. Although 57% of all TCRβhigh cells were still alive after the culture period, this was true for only 16% of the corresponding transgenic cells (Fig. 8⇓). Taken together, TCRβhigh cells in NICA rats are highly sensitive to spontaneous apoptosis, suggesting that they are not only phenotypically arrested at an immature stage but have also acquired functional properties different from their WT counterparts. Spontaneous thymocyte apoptosis. A, Fresh thymocytes (0 h) and thymocytes cultured for 24 h were analyzed by flow cytometry using annexin V in combination with mAbs against CD4, CD8, and TCRβ. The absolute number of live TCRβhigh and DP thymocytes was determined after gating on annexin V− cells. Statistical analysis was performed using Student’s t test, n = 15. Several molecular genetic approaches have been undertaken to study Notch1 signaling in the thymus but have arrived at partially conflicting results. Although two distinct strains of conditional Notch1-KO mice share no defects in the generation of mature SP thymocytes (18, 19), overexpression experiments have suggested that constitutively active Notch1 biases thymocyte development toward the CD8 lineage or even prevents the maturation of SP cells completely (20, 21, 22, 23). In the light of this ongoing debate, we have generated transgenic rats expressing Notch1IC in the thymus. For maximal comparability to previously published experiments, we used the same transgene construct as described by Robey et al. (21). Therefore, differences in the phenotype between our transgenic rats and the previously reported transgenic mice should not be related to the transgene construct used. The phenotype of the two published Notch1IC-transgenic mouse strains is largely comparable when analyzed before weaning (22). Both strains show normal thymic cellularity, increased CD8 SP cell development, and a reduction in the number of CD4 SP thymocytes. Overall, the number of TCRhigh cells is increased in both strains of mice (20, 21). In contrast, bone marrow cells expressing retrovirally delivered Notch1IC fail to progress to the SP stage and become arrested at the DP stage (23). This was explained by their inability to undergo positive selection as indicated by the absence of CD69 and CD25 expression after TCR/CD2 coengagement. Interestingly, our transgenic NICA rats show features of both types of mouse models. Similar to the mice retrovirally expressing Notch1IC, we found a strong reduction in the number of both lineages of mature SP cells and a failure to undergo positive selection. However, the NICA-transgenic rats also resemble the two Notch1IC-transgenic mouse strains in the sense that the remaining mature SP thymocytes are biased toward the CD8 lineage. Therefore, we believe that the mechanism underlying the phenotypes of all Notch1-overexpressing animals is similar, albeit manifesting with a different magnitude in these models. This would suggest that variations in signaling strength possibly because of differences in the genetic background and the copy number of the transgene result in graded effects of Notch1 on T cell maturation. Our data strongly support a model in which sustained expression of the pre-TCR throughout thymocyte development is at least in part responsible for the impaired T cell maturation in NICA rats. It appears that constitutive Notch1 signaling prevents down-regulation of the pre-Tα chain in thymocytes that have passed the β-selection checkpoint. This is compatible with the recent demonstration that the pre-Tα is a direct target of Notch1-mediated transcriptional regulation, although DN cells from Notch1-KO mice were found to have normal levels of pre-Tα mRNA (19, 32). At the same time, expression of the TCRα chain is reduced in post β-selection thymocytes of NICA rats, leading to a partial replacement of regular αβTCR complexes by the pre-TCR. Although not formally shown, we believe that tonic pre-TCR signaling in NICA rats is responsible for the reduced re-expression of RAG-1 and RAG-2 in TCRβ+ cells and the failure to down-regulate CD2 in TCRint cells. Apart from these observations, we can only speculate as to the consequences of the estimated replacement of roughly one-third of the TCR on transgenic thymocytes by pre-TCR complexes. Recently, von Boehmer and colleagues (37) demonstrated that the pre-Tα and the TCRα chains are intrinsically different with regard to their ability to induce thymocyte proliferation, survival, and differentiation. This strongly supports the notion that sustained pre-TCR expression impairs T cell maturation. However, pre-Tα-overexpressing mice have only a mild phenotype at later stages of thymocyte development despite the competitive decrease in surface αβTCR formation. Thus, high pre-Tα expression alone may not suffice to impair the generation of mature T cells (27). Indeed, this is in line with the finding that both pre-Tα signaling and Notch receptor-ligand interactions are required for T cell development to proceed past the β-selection checkpoint (38). However, our finding that engagement of the αβTCR in culture overcomes the developmental block of NICA thymocytes suggests that it is altered TCR signaling that affects T cell maturation in the transgenic rats. Taken together, we believe that expression of differently composed TCR complexes underlies at least some of the effects observed in Notch1IC-transgenic animals. A major consequence of the sustained pre-TCR expression appears to be impaired positive selection. First, thymocyte development in transgenic rats is arrested at the TCRβhigh DP stage. Second, we did not find any CD69+ cells, even among the few CD4 and CD8 SP cells. This suggests that transgenic thymocytes fail to undergo positive selection, a finding that has also been described in one of the mouse models (23). We believe that the inability of transgenic thymocytes to become selected is the major cause for the reduction in mature SP cells. This is supported by our observation that virgin DP thymocytes from transgenic rats can differentiate into mature SP cells in a culture system that relies on signaling elicited by TCR-specific mAbs, which primarily act by ligation of αβTCR complexes (30). As one would predict, the large reduction in SP thymocytes results in severe T lymphopenia. However, the few mature T cells that are found in peripheral lymphoid organs of transgenic rats appear to be normal. This assumption is based on the finding that the overselection of Vβ10 into the CD4 subset known to occur in Lewis rats (36) is observed both in WT and transgenic NICA rats. CD4 SP cells show an overall higher TCR level on their surface as compared with CD8 SP cells (39). From this, one can assume that CD4 SP cells are potentially more sensitive to the altered TCR signaling than CD8 SP cells, and therefore, it is this subpopulation that is predominantly affected in Notch1IC-transgenic mice and rats. This provides a convincing explanation for the contradictory finding that T cell development in Notch1IC-transgenic mice is biased toward the CD8 lineage, whereas the absence of Notch1 leaves the generation of SP cells unaffected (7, 8). Collectively, we propose the following model for the role of constitutively active Notch1 in T cell development. Through transcriptional activation of the pre-Tα gene, Notch1 leads to sustained pre-TCR signaling. This partially inhibits TCRα expression and positive selection, prevents progression of the majority of thymocytes to the SP stage, and therefore results in T lymphopenia. Depending on the strength of Notch1 signaling in the various experimental models, it predominantly affects the development of CD4 SP cells or completely prevents T cell maturation. Thus, we believe that sustained pre-TCR expression is at least one mechanism that may explain the partially contradictory findings in Notch1-transgenic and -KO mice published in the past. We thank John Mullins, Gillian Brooker, and Sigrid Hoffmann for their help in establishing the rat transgenesis methodology and Katrin Voss, Melanie Schott, and Christian Linden for expert technical help. We also thank Ellen Robey for providing the transgene construct and Anneliese Schimpl for critical reading of the manuscript. ↵1 This work was supported by the Volkswagen Stiftung Grant I/75 403, Deutsche Forschungsgemeinschaft Grant Re1631/1, and Wilhelm Sander-Stiftung Grant 2003.129.1. ↵3 Abbreviations used in this paper: DN, double negative; SP, single positive; DP, double positive; KO, knockout; Notch1IC, intracellular domain of Notch1; hrIL-2, human rIL-2; HPRT, hypoxanthine phosphoribosyltransferase; WT, wild type. Germain, R. N.. 2002. T cell development and the CD4-CD8 lineage decision. Nat. Rev. Immunol. 2: 309-322. Borowski, C., C. Martin, F. Gounari, L. Haughn, I. Aifantis, F. Grassi, H. von Boehmer. 2002. On the brink of becoming a T cell. Curr. Opin. Immunol. 14: 200-206. Yannoutsos, N., P. Wilson, W. Yu, H. T. Chen, A. Nussenzweig, H. Petrie, M. C. Nussenzweig. 2001. The role of recombination activating gene (RAG) reinduction in thymocyte development in vivo. J. Exp. Med. 194: 471-480. Wang, K., J. L. Klotz, G. Kiser, G. Bristol, E. Hays, E. Lai, E. Gese, M. Kronenberg, L. Hood. 1994. Organization of the V gene segments in mouse T-cell antigen receptor α/δ locus. Genomics 20: 419-428. Guo, J., A. Hawwari, H. Li, Z. Sun, S. K. Mahanta, D. R. Littman, M. S. Krangel, Y. W. He. 2002. Regulation of the TCR-α repertoire by the survival window of CD4+CD8+ thymocytes. Nat. Immunol. 3: 469-476. Bevan, M. J.. 1997. In thymic selection, peptide diversity gives and takes away. Immunity 7: 175-178. Robey, E. A., J. A. Bluestone. 2004. Notch signaling in lymphocyte development and function. Curr. Opin. Immunol. 16: 360-366. Bommhardt, U., M. Beyer, T. Hünig, H. M. Reichardt. 2004. Molecular and cellular mechanisms of T cell development. Cell. Mol. Life Sci. 61: 263-280. Radtke, F., A. Wilson, G. Stark, M. Bauer, J. van Meerwijk, H. R. MacDonald, M. Aguet. 1999. Deficient T cell fate specification in mice with an induced inactivation of Notch1. Immunity 10: 547-558. Han, H., K. Tanigaki, N. Yamamoto, K. Kuroda, M. Yoshimoto, T. Nakahata, K. Ikuta, T. Honjo. 2002. Inducible gene knockout of transcription factor recombination signal binding protein-J reveals its essential role in T versus B lineage decision. Int. Immunol. 14: 637-645. Koch, U., T. A. Lacombe, D. Holland, J. L. Bowman, B. L. Cohen, S. E. Egan, C. J. Guidos. 2001. Subversion of the T/B lineage decision in the thymus by lunatic fringe-mediated inhibition of Notch-1. Immunity 15: 225-236. Izon, D. J., J. C. Aster, Y. He, A. Weng, F. G. Karnell, V. Patriub, L. Xu, S. Bakkour, C. Rodriguez, D. Allman, W. S. Pear. 2002. Deltex1 redirects lymphoid progenitors to the B cell lineage by antagonizing Notch1. Immunity 16: 231-243. French, M. B., U. Koch, R. E. Shaye, M. A. McGill, S. E. Dho, C. J. Guidos, C. J. McGlade. 2002. Transgenic expression of numb inhibits notch signaling in immature thymocytes but does not alter T cell fate specification. J. Immunol. 168: 3173-3180.
van den Brandt, J., K. Voss, M. Schott, T. Hünig, M. S. Wolfe, H. M. Reichardt. 2004. Inhibition of Notch signaling biases rat thymocyte development towards the NK cell lineage. Eur. J. Immunol. 34: 1405-1413. Wolfer, A., T. Bakker, A. Wilson, M. Nicolas, V. Ioannidis, D. R. Littman, P. P. Lee, C. B. Wilson, W. Held, H. R. MacDonald, F. Radtke. 2001. 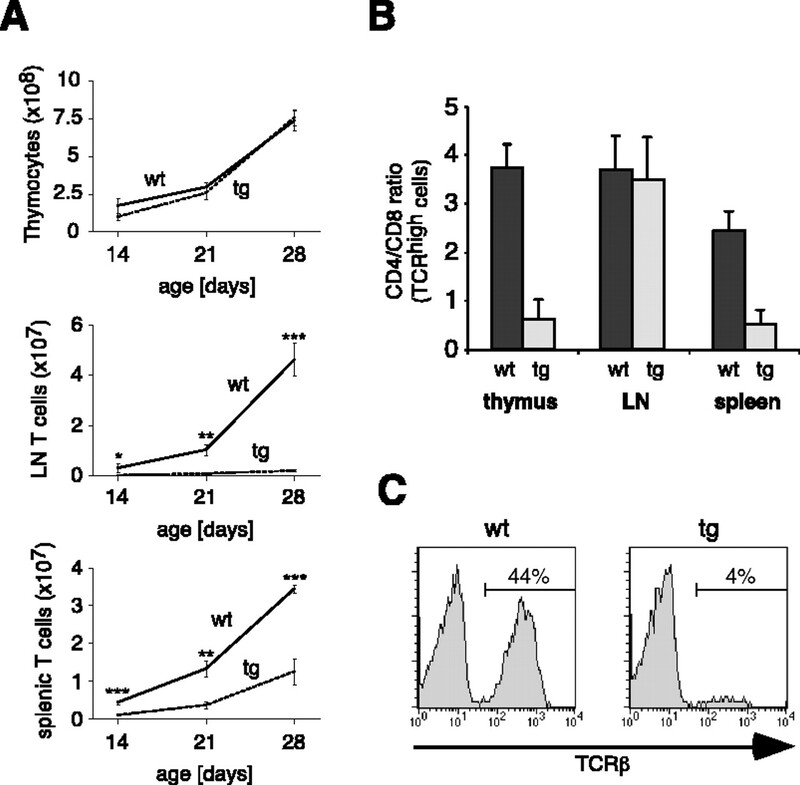 Inactivation of Notch 1 in immature thymocytes does not perturb CD4 or CD8 T cell development. [Published erratum in 2001 Nat. Immunol. 2: 467.]. Nat. Immunol. 2: 235-241. Wolfer, A., A. Wilson, M. Nemir, H. R. MacDonald, F. Radtke. 2002. Inactivation of Notch1 impairs VDJβ rearrangement and allows pre-TCR- independent survival of early αβ lineage thymocytes. Immunity 16: 869-879. Deftos, M. L., E. Huang, E. W. Ojala, K. A. Forbush, M. J. Bevan. 2000. Notch1 signaling promotes the maturation of CD4 and CD8 SP thymocytes. Immunity 13: 73-84. Robey, E., D. Chang, A. Itano, D. Cado, H. Alexander, D. Lans, G. Weinmaster, P. Salmon. 1996. An activated form of Notch influences the choice between CD4 and CD8 T cell lineages. Cell 87: 483-492. Fowlkes, B. J., E. A. Robey. 2002. A reassessment of the effect of activated Notch1 on CD4 and CD8 T cell development. J. Immunol. 169: 1817-1821. Izon, D. J., J. A. Punt, L. Xu, F. G. Karnell, D. Allman, P. S. Myung, N. J. Boerth, J. C. Pui, G. A. Koretzky, W. S. Pear. 2001. Notch1 regulates maturation of CD4+ and CD8+ thymocytes by modulating TCR signal strength. Immunity 14: 253-264. Mullins, L. J., J. J. Mullins. 1996. Transgenesis in the rat and larger mammals. J. Clin. Invest. 97: 1557-1560. Reichardt, H. M., T. Umland, A. Bauer, O. Kretz, G. Schütz. 2000. Mice with an increased glucocorticoid receptor gene dosage show enhanced resistance to stress and endotoxic shock. Mol. Cell. Biol. 20: 9009-9017.
van den Brandt, J., D. Wang, S.-H. Kwon, M. Heinkelein, H. M. Reichardt. 2004. Lentivirally generated eGFP-transgenic rats allow efficient cell tracking in vivo. Genesis 39: 94-99. Lacorazza, H. D., H. E. Porritt, J. Nikolich-Zugich. 2001. Dysregulated expression of pre-Tα reveals the opposite effects of pre-TCR at successive stages of T cell development. J. Immunol. 167: 5689-5696. Reichardt, H. M., K. H. Kaestner, J. Tuckermann, O. Kretz, O. Wessely, R. Bock, P. Gass, W. Schmid, P. Herrlich, P. Angel, G. Schütz. 1998. DNA binding of the glucocorticoid receptor is not essential for survival. Cell 93: 531-541. Otto, C., H. M. Reichardt, G. Schütz. 1997. Absence of glucocorticoid receptor-β in mice. J. Biol. Chem. 272: 26665-26668. Hünig, T., R. Mitnacht. 1991. T cell receptor-mediated selection of functional rat CD8 T cells from defined immature thymocyte precursors in short-term suspension culture. J. Exp. Med. 173: 561-568. Hünig, T., N. Torres-Nagel, B. Mehling, H. J. Park, T. Herrmann. 2001. Thymic development and repertoire selection: the rat perspective. Immunol. Rev. 184: 7-19. Reizis, B., P. Leder. 2002. Direct induction of T lymphocyte-specific gene expression by the mammalian Notch signaling pathway. Genes Dev. 16: 295-300. Torres-Nagel, N. E., G. Giegerich, D. P. Gold, T. Hünig. 1994. Identification of rat Tcra-V 4 and 8 gene products by monoclonal antibodies and cDNA sequence. Immunogenetics 39: 367-370. Krangel, M. S., J. Carabana, I. Abbarategui, R. Schlimgen, A. Hawwari. 2004. Enforcing order within a complex locus: current perspectives on the control of V(D)J recombination at the murine T-cell receptor α/δ locus. Immunol. Rev. 200: 224-232. Torres-Nagel, N. E., T. Herrmann, G. Giegerich, K. Wonigeit, T. Hünig. 1994. Preferential TCR V usage in rat repertoire selection: Vα8 imparts both positive thymic selection by and alloreactivity to RT1f. Int. Immunol. 6: 1367-1373. Borowski, C., X. Li, I. Aifantis, F. Gounari, H. von Boehmer. 2004. Pre-TCR-α and TCR-α are not interchangeable partners of TCR-β during T lymphocyte development. J. Exp. Med. 199: 607-615. Ciofani, M., T. M. Schmitt, A. Ciofani, A. M. Michie, N. Cuburu, A. Aublin, J. L. Maryanski, J. C. Zuniga-Pflucker. 2004. Obligatory role for cooperative signaling by pre-TCR and Notch during thymocyte differentiation. J. Immunol. 172: 5230-5239. Hünig, T., H. J. Wallny, J. K. Hartley, A. Lawetzky, G. Tiefenthaler. 1989. A monoclonal antibody to a constant determinant of the rat T cell antigen receptor that induces T cell activation: differential reactivity with subsets of immature and mature T lymphocytes. J. Exp. Med. 169: 73-86.